Murdo Ritchie (RCN ) in his Abandon the Mind-forg’d Manacles offers an alternative analysis of the rise of the SNP. None of the above? This is the question I’ve been asking myself for the last few weeks. Or perhaps more accurately for the last few years. Having never been a member of a political party, I’m what pollsters call a floating voter. Granted, as someone who has been a political activist for nearly 30 years, I might not be the stereotypical floating voter but nonetheless I have no tribal loyalty to any political party. 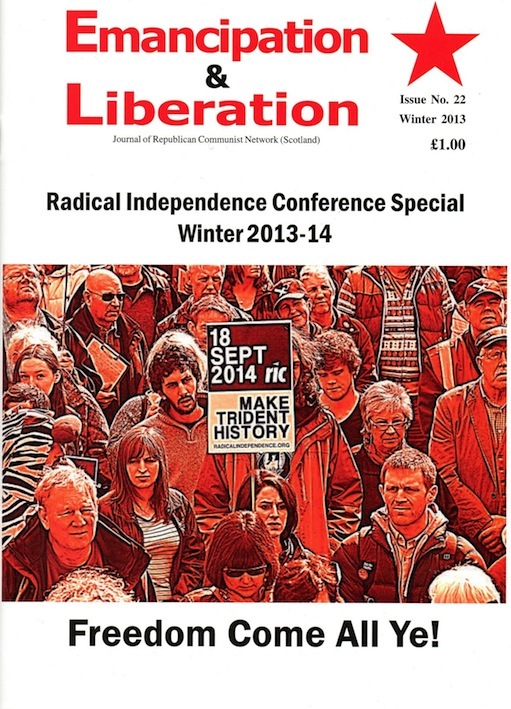 We are posting a new link to an electronic version of the special issue of Emancipation & Liberation, issue no 22, the RCN produced for the second Radical Independence Campaign conference, held in the Marriott Hotel in Glasgow on November 23rd, 2013. This will provide some basis for assessing the changes, which have occurred in the political situation in Scotland over the last year, and how RIC has met the new challenges. The RCN will be producing another special issue of Emancipation & Liberation for this year’s conference. Get your copy at the second Radical Independence Conference being held in the Clydeside Auditorium in Glasgow on November 22nd. 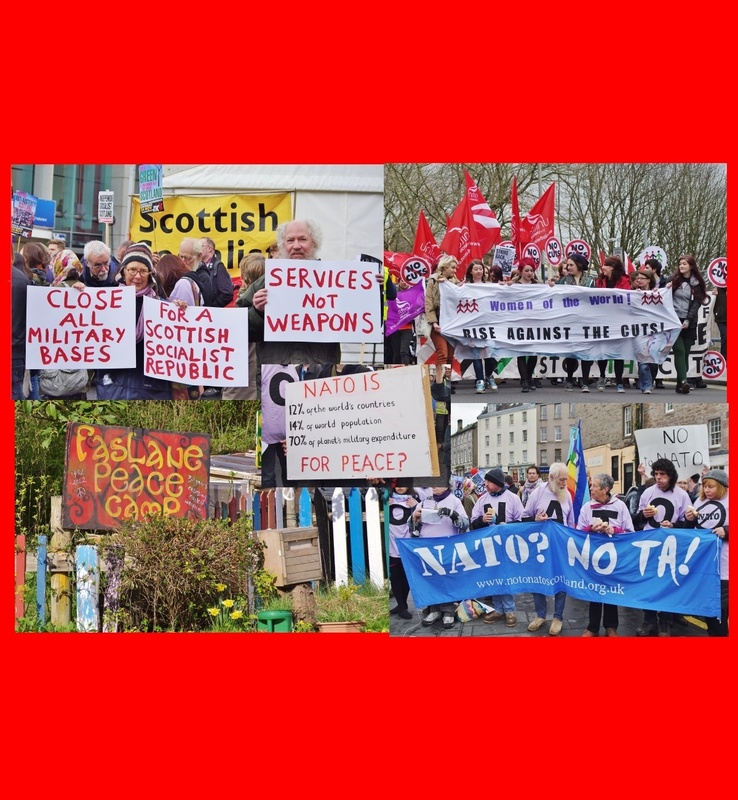 The Radical Independence Conference (http://radicalindependence.org/), being held this Saturday, 24th November in Glasgow, is likely to be the biggest gathering of the Left in Scotland for many years. 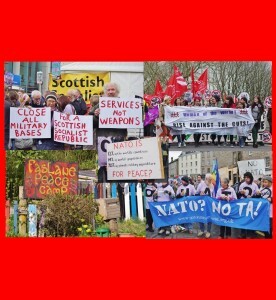 The RCN has been covering this event since the first open organising meeting in June. 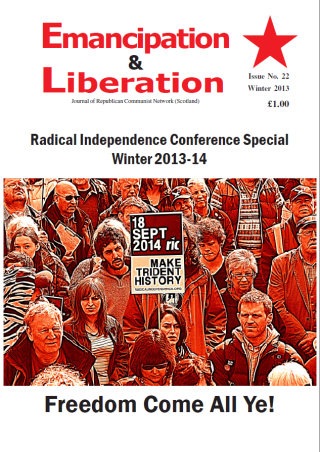 We have produced a special issue of our magazine, Emancipation & Liberation, no, 21, for this conference. Anyone attending, who would like a free copy, just collect it from our stall. Below, can be found the list of the magazine’s contents and the Editorial which outlines our hopes for this Conference. 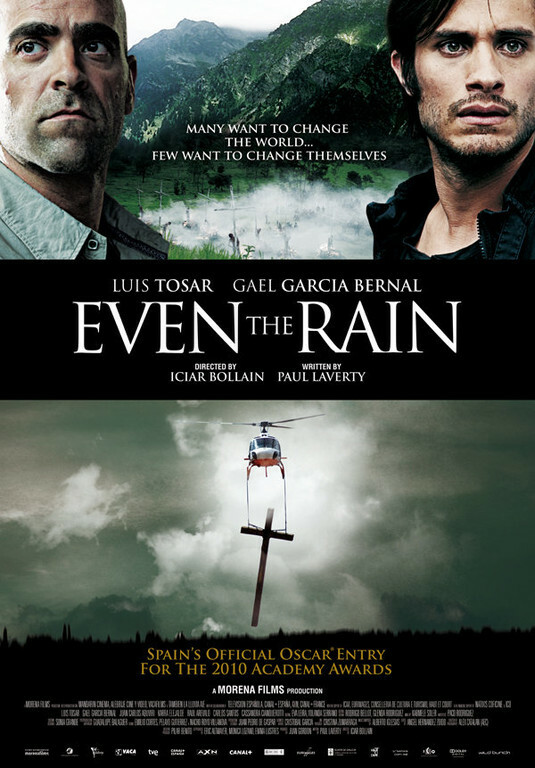 Paul Laverty’s Even the Rain is a very powerful film that works on several levels. As a piece of drama, with a compelling musical soundtrack, it captures and holds your attention. 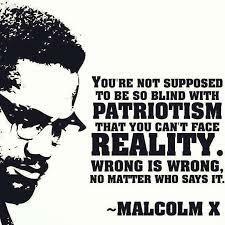 You would not have to be politically engaged to enjoy this film. However, for anybody at all concerned about the present state of the world, and the inspiring growth of challenges to the global corporate order in South America, this is a must-see film. The film begins with two Spanish film-makers, Sebastian and Costas, recruiting a cast from amongst the local Quechua Indians of Cochabamba in Bolivia to make their own film. This film-within-a-film is to be about Columbus’ conquest of the Tainos Indians in Hispaniola; and two Dominican friars, Antonio de Montesinos and Bartolome de Las Casas, who attempted to challenge the brutal behaviour of the Spanish conquistadores. This film’s director, Sebastian, has been greatly affected by his personal discovery of La Casas’ unsuccessful appeal to King Philip of Spain. In protest at the sheer brutality of the treatment of the Indians, Las Casas held to the view that, “All people of the world are humans.” Sebastian sees this as having a strong contemporary relevance. However, the producer, Costas, has chosen Bolivia for the film-shoot, because it has the cheapest labour in South America. Furthermore, in order to make the film, it is the official Bolivian and Cochabamba authorities, still dominated by the descendents of the original conquistadores, who Costas and Sebastian deal with. Early on, whilst enjoying themselves, eating and drinking in conditions of some luxury, the principal Spanish actors in this film become engaged in arguments about the nature of the Conquest, and about Columbus, Montesinos and Las Casas. However, as the main film proceeds, the limitations of conservative versus liberal sentiments becomes very clear. By the end of the film, the original participants in these arguments adopt quite different positions. For what makes the fortunes of this particular planned film different from other films, using ‘Third World’ settings and low-cost local casts, is the dramatic intrusion of external events. In 2000, a massive protest emerged in Cochabamba. This involved the local Quechua population struggling against the Bolivian government’s attempt to enforce water privatisation. A joint British, Italian, US and Spanish consortium, Aguas del Tunari, was given monopoly control of Cochabamba’s water supply under the World Bank’s Structural Adjustment Programme. The main film shows how the Bolivian state starts to enforce the company’s monopoly by getting the local police to padlock the people’s wells. Initially, only Maria, Sebastian’s assistant, understands the wider significance of these events, and wants to devote time to making a film about them. Meanwhile, Sebastian and Costas have recruited Daniel, a local Quechua Indian, to play the role of Atuey, a key leader in the failed Tainos revolt against Columbus and Spanish rule. However, whilst impressed by Daniel’s forceful character, they do not initially realise that he is a prominent activist in the Cochabamba protests. Even the Rain is largely made in the Spanish language, although the sub-titles hardly detract from the unfolding drama. However, when Costas resorts to the English language so that Daniel won’t understand what he says, he reveals his own prejudices. Daniel has worked in the USA, and understands English – as well as speaking both Spanish and Quechua. From then on the central dramatic narrative of the film turns on Costas’ and Daniel’s changing personal relationship. The Bolivian government’s clampdown on the massive protests in Cochabamba increasingly impinges on the making of Sebastian and Costas’ Columbus film. The completed scenes from this film are powerful in themselves. However, the Quechua women actors refuse to finish a scene which would involve them showing the drowning of their babies to avoid them being ripped to pieces by the conquistadores’ hunting dogs. Meanwhile, Daniel’s daughter, Belen (who has been given an important role in the Columbus film as Panuca) and his wife, Teresa are shown actively involved in the water privatisation protests. Costas and Sebastian become more and more aware of the contradictions of trying to complete a film showing the historical inhumanity of the Spanish conquest, whilst Daniel and Belen, in particular, become subjected to the contemporary brutality of the Bolivian government and Cochacamba authorities. The dramatic highpoint occurs when, during the making of the Columbus film, the conquistadores burn Atuey and other Tainos at the stake. Las Casas beseeches the conquistadores not to go on with the burning, because it will show the Catholic Church in a bad light, and make a martyr out of Atuey. This has no effect, highlighting the limitations of such liberal appeals. However, this is immediately followed by the direct action of the Quechua Indian actors, when they overturn the police car, sent to the film-set to arrest Daniel. Daniel is set free to continue the anti-water privatisation protest, which results in a notable victory. The last scenes of the film concentrate on the relationship between Costas, Teresa, Belen, and Daniel. Indeed, it is the personal transformation in Costas, under their influence, which gives this film a wider appeal, as his own values are challenged and begin to change. However, for socialists there is also the very strong political message in this film. 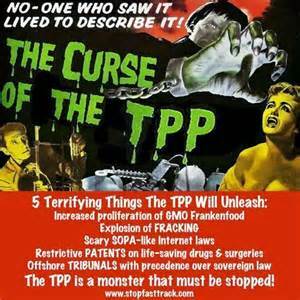 There are no depths to which corporate capital and its imperial backers will not stoop. The film’s title, Even the Rain, makes this clear. They would even deny people access to life-giving water in order to make a profit. Nowadays, we are witnessing a massive extension and imposition of the Structural Adjustment Programmes, long practised in the ‘Third World’ – most obviously in Greece. However, this film shows a key turning point in the beginnings of the rise of continent wide protest against US imperialism and the activities of the global corporations, the IMF and World Bank. Hasta la Victoria Siempre! Can you tell us something about your collective, Insumisas and the Feminist Spider? MM: The Feminist Spider is a communal space for discussion in which numerous collectives and social movements participate. We at Insumisas are participating as a collective within that space in different ways. The Spider is still not what you could describe as a feminist movement with militants just yet. For instance, we at Insumisas carry out numerous events in Carabobo state, we participate in Mission Sucre with our student-comrades, with comrades from the communities, comrades who are organized in the communal councils. Basically what we are trying to do is carry out a type of political education with respect to feminism and socialism through the women’s organization processes in the communal councils, that’s to say, using whatever methods possible to promote and build gender equality and justice committees. Venezuela celebrated International Women’s Day on March 8. Can you comment on the significance of the day and why it is important in Venezuela? MM: I think it’s necessary to re-conceptualize International Women’s Day from the important perspective of being a working class woman. We need to win the day back from capitalism, which has tried to commercialize it. It’s now a day about buying flowers and saying, “Oh, look how great women are”. I think that we have to rescue its educational meaning, its message of struggle and rebellion, its concept of participation and organization, basically its revolutionary character, no? On March 8 we celebrated the day (in Venezuela) and the atmosphere of enthusiasm was tangible, really militant. It seemed to me, being in the epicenter of the march with all the other women, from Mission Madres del Barrio and other working women from all over the country, you could really feel the spirit of the politically organized woman, the woman who is participating in the community, the woman who really believes in this revolutionary process. In short, I think the day is really important on a global level for working class women, and it’s important to give the day its original character back, which is that of class struggle. Because historically, this day started to be commemorated because of working class women’s struggles, from their labor demands. Can you comment a little bit about the politics of the Bolivarian government with respect to women? Have you noticed a change in terms of this government’s policies and those of previous governments? MM: It is thanks to the revolutionary process that women’s participation is even taken into account, obviously we are grateful to the revolutionary process, because as women, we have greater participation and greater opportunities, not just in terms of our role but also in practice, because we have all those instances of popular power and participation. The revolution has generated the spaces for us women to organize, and to respond to, debate and reflect over our reality within capitalist society, in which we are still living, no? I think that the communal councils have gender equality, as well as other spaces such as the governmental federal committees, the party, and in the recognition that social movements can generate policy. All of these are tools for participation in which women are recognized and which try to drive forward the participation of women. 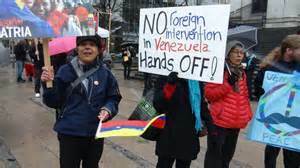 What would you say to the feminists in other countries who criticize Venezuelan feminism for being too class orientated, as opposed to focusing on issues specific to women? MM: I think it’s really about carrying out a historic revision of feminism. What has happened to feminism as a global movement? I think that women from other places in the world, especially the West, should reflect at length about what has happened to the Marxist-feminist proposal, socialist-feminism; what has happened to those proposals in their respective countries? Because let’s say that we have had some currents which have broken away and have stayed within the arena of simply making liberal demands. They don’t organize towards the transformation or the surmounting of exploitation or the patriarchy, viewed as the complimentary functional system to capitalism. Feminism has suffered from, just like the global left, ideological deviations that can’t be hidden. I think, what we are trying to do in Venezuela is to recover all of that material and those feminist proposals, Marxist-feminism with class consciousness. Because without feminism, socialism can’t exist, and without socialism, true feminism cannot exist. Venezuela is famed for its beauty competitions. As a feminist collective do you have a position with respect to this? MM: The culture of the media has had a really profound effect on society, and obviously there is a culture, not just in Venezuela but in other countries in Latin America and Europe, which seeks to market women’s bodies. It converts women into an object that is bought and sold, it dehumanizes women completely, it turns them into merchandise. I think, in this sense, the struggle should be about opening more spaces in the media which reflect how diverse we are as women, in every sense, and that we become more aware. That’s a successful political strategy because (in Venezuela) there is alternative media, which little by little is starting to promote the fact that another type of woman exists, a woman who builds things, creates things and has things to contribute. Not the stereotypical woman that is sold by capitalism. The Feminist Spider has been organizing workshops from a gender perspective for the new Labor Law which is due to be passed by the government in May of this year. What are the principal proposals that have been developed through these workshops? MM: We as socialist feminists, with respect to the discussions surrounding the new labor law, are worried and concerned over the issue of women and the work environment. We are conscious that we as women have particular conditions in our work environment, whether we are on a salaried wage or working as part of the informal economy, which is made up of a lot of women. Those are the kind of issues that we have been discussing at the workshops. We have tried to orientate the discussion towards how to regulate our working environments and what we can do for the huge mass of women inside the informal economy, such as women selling products in a catalogue, street-sellers, hairdressers, etc. This is all indirect work. Our main preoccupation is how to regulate and guarantee labor rights for the female working population. Because our work also goes above and beyond the working day, our work also includes the intellectual and productive work that women carry out at home. We have a lot of challenges, above all because a lot of responsibilities fall onto the shoulders of women, a lot of social responsibilities. It’s important to point out that these responsibilities aren’t just women’s responsibilities, but they are in fact social responsibilities; looking after children, the sick, the old, education. These are responsibilities that historically have fallen upon each one of us as women. We have to create, evaluate and socialize the concept of these tasks as social responsibilities, so that these areas become collective spaces of work and education. That is basically the focal point of our proposals towards the new labor law.